Leaving Melaka around 8 am a quick taxi ride to the bus station we got breakfast at the station and off we went to Kuala Lumpur. Had an enjoyable conversation with Sarah about fantasy movies, books and TV shows, a surprise indeed (although I’ve never watched the Twilight series). After arriving at our hotel we went out for lunch (Thai chicken for me) and afterwards did some shopping for a few hours. Luckily my group of shoppers got back before the rain (I’ve been very lucky weather wise). 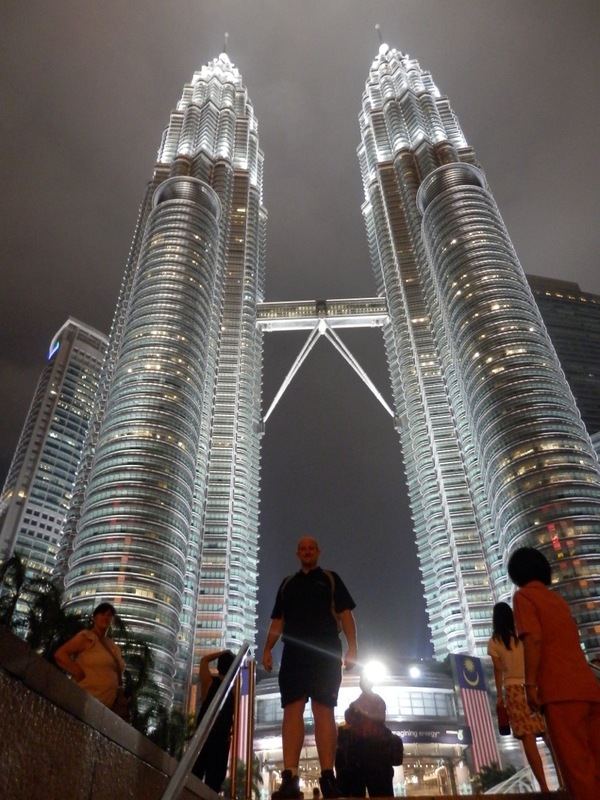 For the evening we headed to the Petronas Towers, world famous they are magnificent light up at night. Dinner in Chinatown was followed by shopping in an area that went on forever, seems like shopping is a sport in this town. The merchants were more assertive here trying to get you to buy, which I expected everywhere in Asia to be honest. We did manage to eventually find our way home very late. A fun day. This entry was posted in World Trip 2012 and tagged Malaysia, SouthEastAsia. Bookmark the permalink.